The Deschutes River is a river which runs through central Oregon and is a major tributary to the Columbia River. It provided a major route to and from the Columbia for Native Americans and later pioneers on the Oregon Trail. It flows mostly through rugged and arid country and its valley provides a cultural heart for central Oregon. Today the river is most known for its outstanding whitewater rafting. In fact, the Deschutes River is known throughout the United States as a premier river for whitewater rafting, fishing, canoeing, kayaking, hiking, and beautiful scenery. 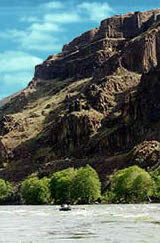 Along with this natural allure the river shares a rich history and importance to Central Oregon. Because of it’s pristine ecology, abundant wildlife and beautiful landscape, it has been officially designated as a Wild and Scenic River by the United States Congress. The Deschutes River features ruggedly beautiful scenery, outstanding whitewater rafting and paddling, and is renowned worldwide for sport fishing (steelhead, brown trout, and native rainbow trout). The Upper Deschutes River features primarily flatwater boating with limited whitewater and excellent trout fishing opportunities. The Middle Deschutes River has excellent hiking opportunities with spectacular geologic formations and waterfalls, but boating is limited. Sage Canyon River Co. operates on the Lower Deschutes River, which offers the greatest opportunities for whitewater rafting in Oregon and is one of Oregon’s premier steelhead and trout fishing areas. The river was originally named Riviere des Chutes or Riviere aux Chutes, French for River of the Falls, during the period of fur trading. Lewis and Clark encountered the river on October 22, 1805 and referred to it by the Native American name Towarnehiooks; on their return journey they gave it the new name Clarks River. During the middle 19th century, the river was major obstacle for emigrants on the Oregon Trail. The major crossing point on the river was near its mouth in present-day Deschutes River State Recreation Area. Many emigrants camped on the bluff on the west side of the river after making the crossing. The remains of the trail leading up to the top of the bluff are still visible.